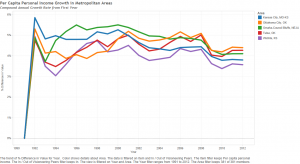 When should Wichita compare itself to peers? In a Wichita Eagle article about the Intrust Bank Arena in downtown Wichita, we see Wichita public relations consultant Vera Bothner complain that Wichita is being unfairly compared to other cities in our region, in particular Oklahoma City, Tulsa, and Kansas City. Wichita is smaller than these cities, she says, and we should not hold Wichita to a standard that it can’t meet. During the recent sales tax campaign, pro-tax advocates often mentioned Oklahoma City and Tulsa as cities that Wichita should emulate. So it may be confusing for Wichita voters to determine when a comparison of Wichita to Oklahoma City and Tulsa is valid, and when it is not. There is a trend, however. 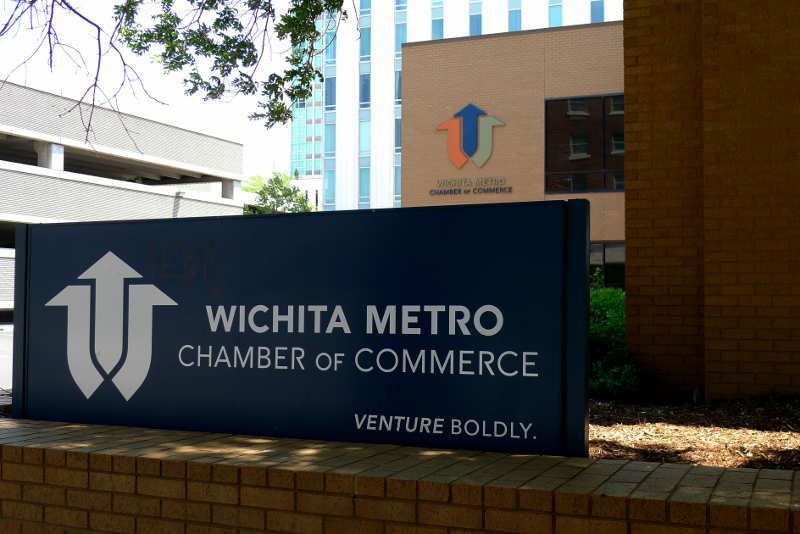 For the Wichita business establishment, represented by the Wichita Metro Chamber of Commerce (Bothner is a member of its executive committee), the trend is for more taxes and more government spending. Whenever a comparison can be made that results in the conclusion that there’s not enough taxation and government spending in Wichita, it’s likely the Wichita Metro Chamber of Commerce will do that. 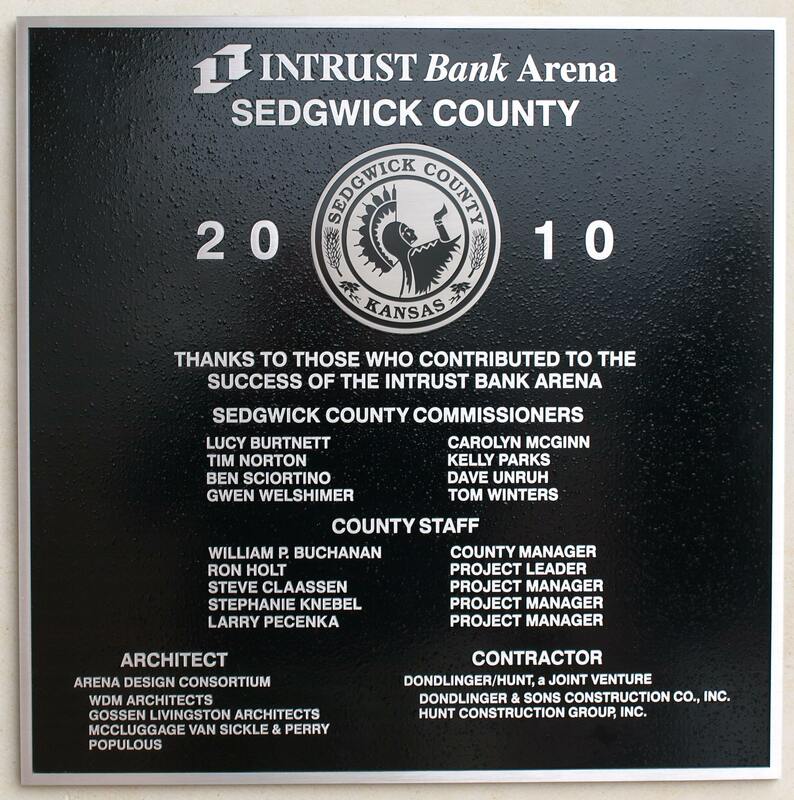 Here’s an excerpt from After 5 years, Intrust Bank Arena still battles image problem. Listening to at least two of the three speakers, it sounds like Wichita’s not been using incentives. 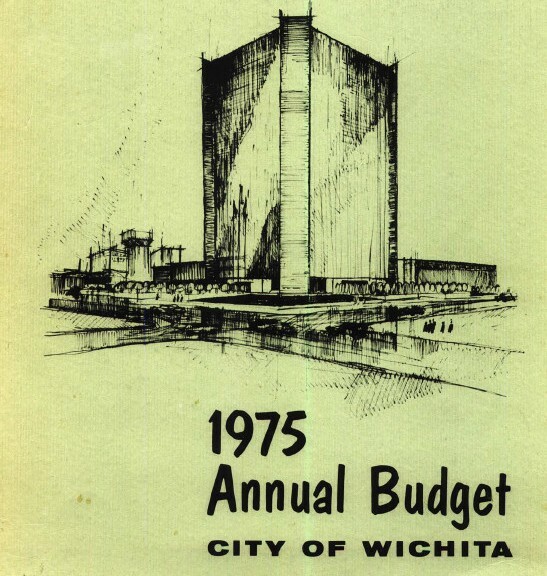 Two-and-a-half years ago when Boeing announced it was leaving Wichita, Mayor Brewer angrily produced a document saying since 1980, we’ve given Boeing $658 million in tax forgiveness. Last year the city and the state were somehow able to come up with $84,000 per job for 400 jobs here at NetApp. So we’ve been using a lot of incentives, haven’t we? What are we going to do different now, that hasn’t worked for us, clearly, in the past. I’m not sure that I agree that it hasn’t worked for us in the past. 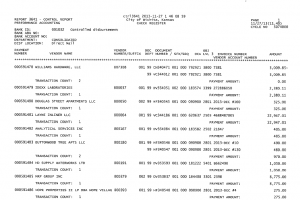 In fact, Boeing is still one of the largest taxpayers in the city. It has $6 million of real estate taxes paying a year. The Boeing facilities are still paying taxes in this community. Again, the jobs aren’t here, but Boeing on its rebates paid those back, those are on incremental property that it invested that came back on the tax rolls over time, and I think 6 million is the correct number last I looked there is still on the tax rolls in this city. So you have got pay back. And NetApp? NetApp is a win for the city. If you look at the economic models measuring the results of those 400 jobs and the fact that now the NetApp relationship likely to happen on the campus of Wichita State, that’s economic growth. Those are the kinds of jobs you need to attract. What are we going to do differently? We’re going to look at infrastructure more, we’re looking at a more integrated program across the spectrum. WSU is certainly a big part of that program, we’re going to get serious about diversification. We only talk about diversification in the city when the economy is down. We need to be a long-term program for diversification, taking the skills we have and looking at those skills and attracting companies here, helping our companies to expand. We need to invest in our work force, whether it’s at college level or particular to the technical colleges. Again those are the kinds of investments that are going to create a workforce that becomes attractive. 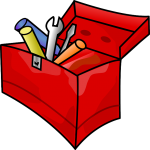 It’s just one component, I think if we said it’s one tool in the toolbox. That’s a very important tool. And we are up against communities like Oklahoma City that has $75 million sitting in a fund and believe me that’s a lot more than we’ve invested in the last 10 years. And we will continue to get beaten in the competition if we don’t get more serious about being able to fight for the jobs and you can ask most business owners, particularly manufacturing, they’re called constantly from other communities trying to recruit then out of this community. And that competition is only going to get more intense, in my opinion. So we’ve got to be prepared to wisely invest our money. Allen’s pushback at the idea that the Boeing incentives were a failure produced a few gasps of astonishment from the audience. 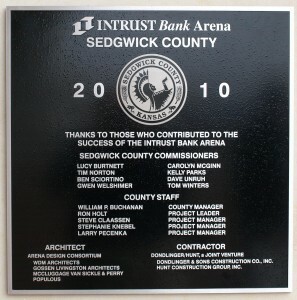 I’m sure that if any of Wichita’s elected officials had been in attendance, they would also have been surprised. But now an icon of Wichita’s business community says that since Boeing is paying $6 million per year in property taxes, it really was a good investment, after all. Today, however, no one is working in these buildings. No productive economic activity is taking place. But, government is collecting property taxes. This counts as an economic development success story, according to the people who support the proposed Wichita sales tax. Another important thing to learn from this conference, which is hinted at in Allen’s answer, is that sales tax supporters are not recognizing all the incentives that we have in Wichita. One speaker said “It would be a travesty for you to do nothing.” (He was from out of town, but the Wichita Metro Chamber of Commerce selected him to speak and presented him as an expert.) But as we know from the premise of my question, we have many available incentives, and in large amounts, too. Another problem is Allen’s disagreement that what we’ve done has not been working. 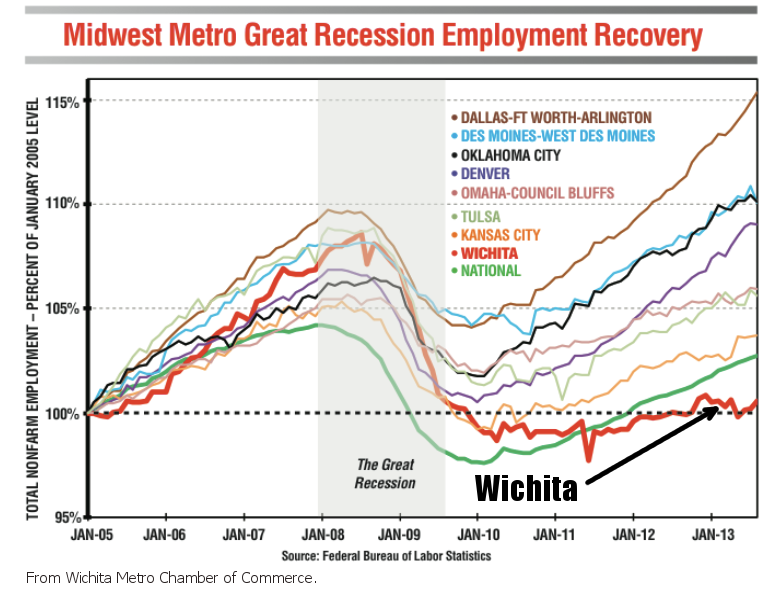 This is contrary to the evidence the Wichita Chamber has been presenting, which is that we have lost thousands of jobs and are not growing as quickly as peer cities. That is the basis of their case for spending more on economic development. Allen also spoke of a $75 million fund in Oklahoma City, saying it is much larger that what we’ve invested. I’m sure that Allen is not including all the incentives we’ve used. There were some years, for example, when the value of the abated taxes for Boeing was over $40 million. Last year the city initiated a process whereby NetApp saved $6,880,000 in sales tax, according to Kansas Department of Commerce documents. These tax abatements are more valuable than receiving the equivalent amount as a cash payment, as the company does not pay income taxes on the value of abated taxes. Wichita voters will also want to consider the list of things Allen said we will do differently in the future. He spoke of concepts like infrastructure, an integrated program, diversification, investing in our work force, attracting companies, and helping existing companies expand. He told the audience “So we’ve got to be prepared to wisely invest our money.” There are two things to consider regarding this. First, these are the things we’ve been talking about doing for decades. Some of them we have been doing. Second, the people saying these things — promising a new era of economic development in Wichita — are the same people who have been in charge for decades. They’ve been chairs of the Wichita Metro Chamber of Commerce, Greater Wichita Economic Development Coalition, Visioneering Wichita, Wichita Downtown Development Corporation, and Go Wichita Convention and Visitors Bureau. They’re the members of the leadership committee the Chamber formed. These people are Wichita’s business establishment. They’ve been in charge during the time the Wichita economy has fallen behind. Now, they promise reform. We will do things differently and better, they say. Now, we will prepare to invest wisely, Allen told the audience. If these leaders are truly interested in reforming Wichita’s economic development machinery and processes, they could have started years ago using the generous incentives we already have. Former Wichita mayor: Where is the water? Former Wichita mayor Bob Knight explains that when he left office in 2003, we were assured we had water for 50 years. What has happened? Knight also reminded the audience that there is a Sedgwick County sales tax, part of which is divided among cities like Wichita. He also took the Visioneering planning process to task. 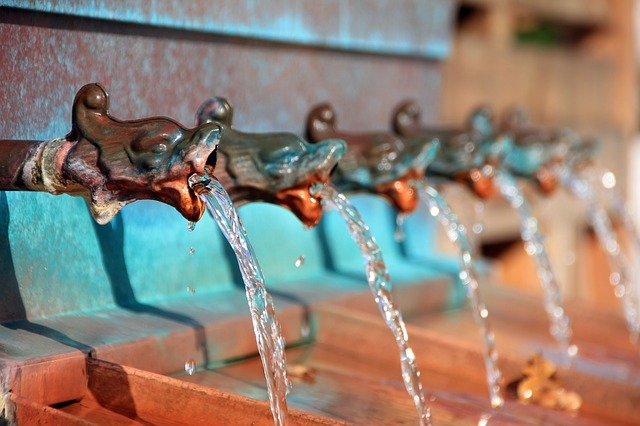 In the past ten years, he wondered why no one asked about a city without water. From a forum at Wichita Pachyderm Club on July 22, 2014. View below, or click here to view at YouTube. The Wichita metropolitan area compares well creating jobs in local government, but trails in private sector jobs. Data from the Bureau of Labor Statistics through 2013 allows us to compare the Wichita metropolitan area with the peers selected by Visioneering Wichita. I’ve gathered BLS data divided by industry sector. 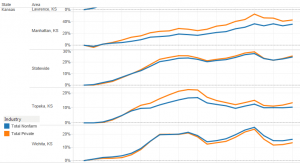 Growth in Local Government Jobs, Wichita and Visioneering Peers. Wichita is the dark line. When considering only government jobs, especially local government jobs, Wichita ranks high. 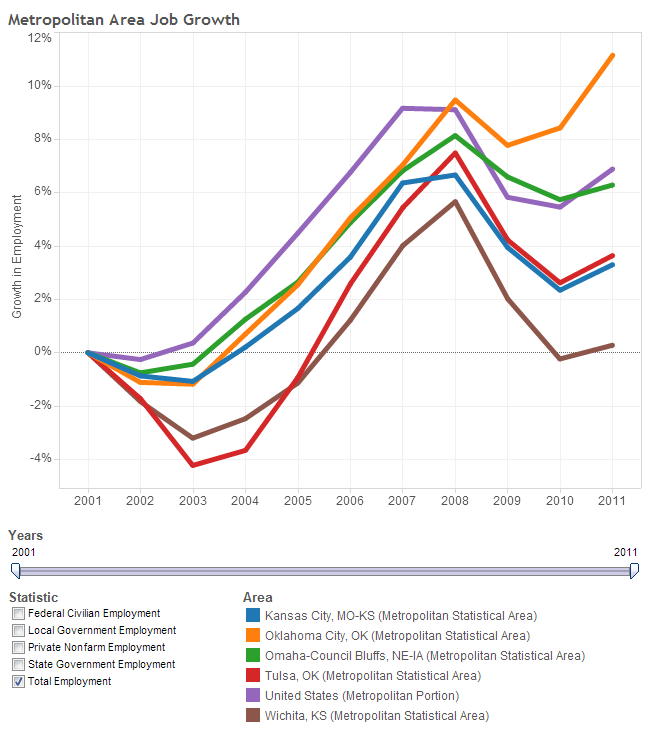 When looking at private sector jobs, however, Wichita is in last place, and by a wide margin. In Wichita, we see our local government proposing to grow itself even more by recommending that voters approve increased sales taxes to pay for more government programs. Officials tell us the increased spending is needed so that government can correct problems with Wichita’s economy, water supply, transit, and streets. 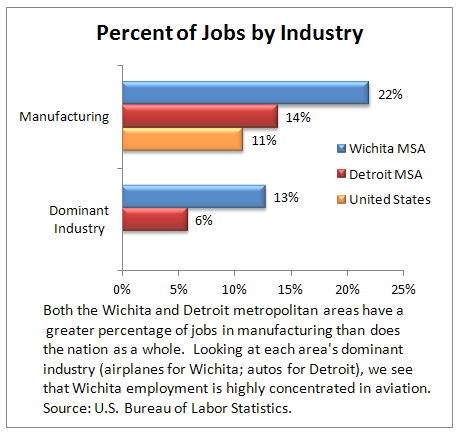 Growth in Private Sector Jobs, Wichita and Visioneering Peers. Wichita is the dark line. Wichita’s government has created problems, by the mayor’s admission. Now, Wichita politicians and bureaucrats ask that we rely on government to fix the problems. The interactive visualization I’ve created from BLS data lets you compare Wichita’s job growth with our Visioneering peers. You can select various industry sectors for display. Data is from the Bureau of Labor Statistics of the U.S. Department of Labor. Visualization created by myself using Tableau Public. 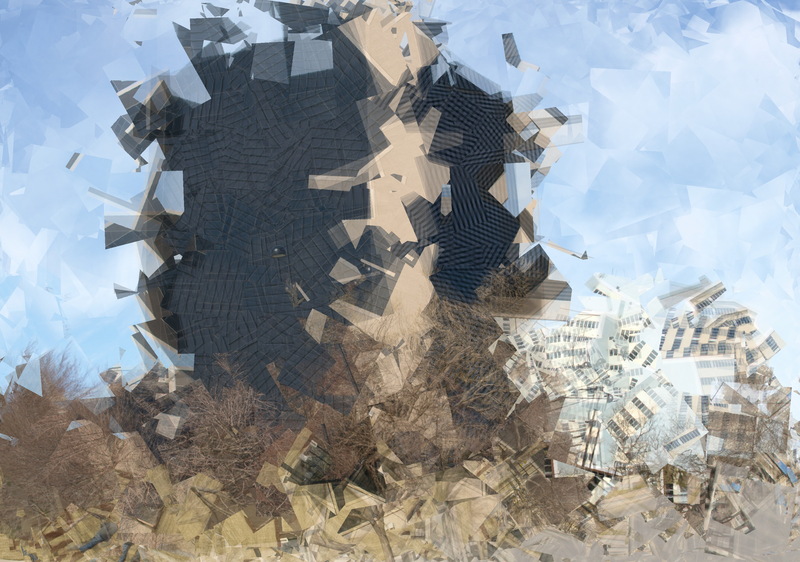 Click here to open the visualization in a new window. A prominent Wichita business uses free markets to justify its request for economic development incentives. A gullible city council buys the argument. This week Bombardier was before the council again asking for property tax abatements. 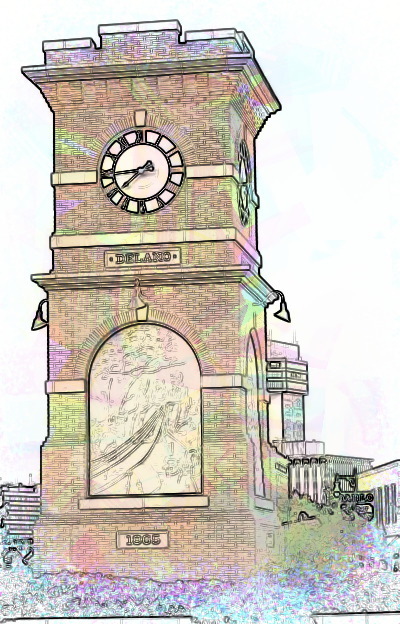 City documents estimate the amount of tax to be forgiven as $1,098,294 annually, for up to ten years. The document prepared for council members did not address sales tax, but generally sales taxes are forgiven when using the program Bombardier qualified for. The December 10 meeting was useful because a representative of Bombardier appeared before the council. His remarks help us understand how some prominent members of Wichita’s business community have distorted the principles of free markets and capitalism. As illustrated by the fawning of Wichita City Council Member and Vice Mayor Pete Meitzner (district 2, east Wichita) and others, elected officials have long forsaken these principles. We must be careful when using the term incentive. In a free-market economy or capitalism, incentive refers to the motivation of the possibility of earning profits. Another incentive — the other side of the same coin — is avoiding losses. That’s why capitalism is called a profit-and-loss system. The losses are just as important as profits, as losses are a signal that the economic activity is not valued, and the resources should be shifted to somewhere else where they are valued more highly. A few thoughts: First, Bombardier is not investing in the community. The company is investing in itself. I’m sure Bombardier’s shareholders hope that is true. Second, the free market system that the speaker praised is a system based on voluntary exchange. That flows from property rights, which is the foundational idea that people own themselves and the product of their labor, and are free to exchange with others. But when government uses incentives, many people do not consent to the exchange. That’s not a free market system. The representative from Bombardier also said that the city’s incentives would reduce Bombardier’s investment risk. There is little doubt this is true. When a company is given money with no strings attached except what the company already intends to do and wants to do, that reduced a company’s risk. What has happened, however, is that risk has not been eliminated or reduced. It has merely been shifted to the people of Wichita, Sedgwick County, the Wichita public school district, and the State of Kansas. When government does this on a piecemeal basis, this is called cronyism. When done universally, we call this socialism. We can easily argue that actions like this — and especially the large subsidies granted to Bombardier by the state — increase the risk of these investments. Since the subsidies reduce the cost of its investment, Bombardier may be motivated to make risky investments that it might otherwise not make, were it investing its own funds (and that of its shareholders). Now the city and Bombardier will say that these investments have a payoff for the taxpayer. That is, if Bombardier grows, it will pay more in taxes, and that constitutes “profit” for taxpayers. Even if we accept that premise — that the city “profits” from collecting taxes — why do we need to invest in Bombardier in order to harvest its “profits” when there are so many companies that pay taxes without requiring subsidy? Finally, the representative from Bombardier said that these incentives are not a handout. I don’t see how anyone can say that and maintain a straight face. Following is a fuller representation of the Bombardier representative’s remarks to the council. There are various aspects to a free-market economy. There’s the rule of law, there’s property rights, and another major aspect is incentives. One party, in this case, the local government, uses incentives for another party, in this case our company, to invest in the community. As the company moves forward to invest in the community, those investments are not without risk. … Your incentives allow us to offset some of that risk so that we can move forward with those investments, which hopefully create new jobs and also then also improves the quality of life in our community. … These incentives are not a handout. They are a way that the local government uses such things to offset some of the risk that is involved in local companies as they invest in the community, bring jobs to the community, and improve the community overall. One of the benchmarks used by Visioneering Wichita to measure the growth of the Wichita-area economy may not be the best statistic, and its interpretation requires caution. 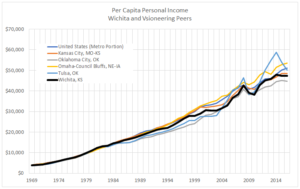 Wichita per capita income compared to the nation. Click for larger version. 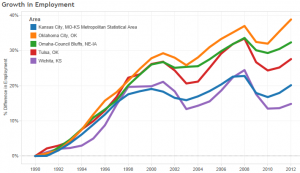 How has the Wichita metropolitan area performed on this benchmark? What are the trends? 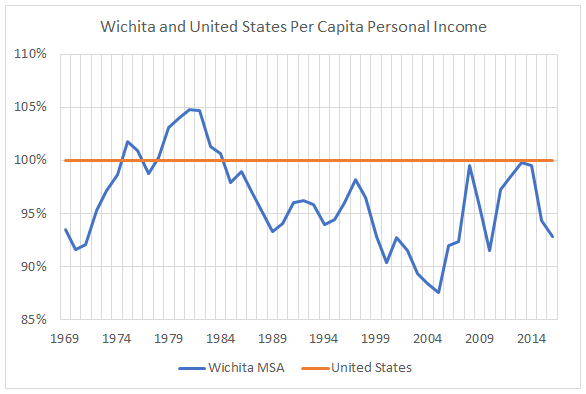 I’ve plotted per capita income for the United States and the Wichita MSA, along with the ratio of Wichita to the nation. The leaders of Visioneering are right to be concerned about the direction of the Wichita economy relative to the country. 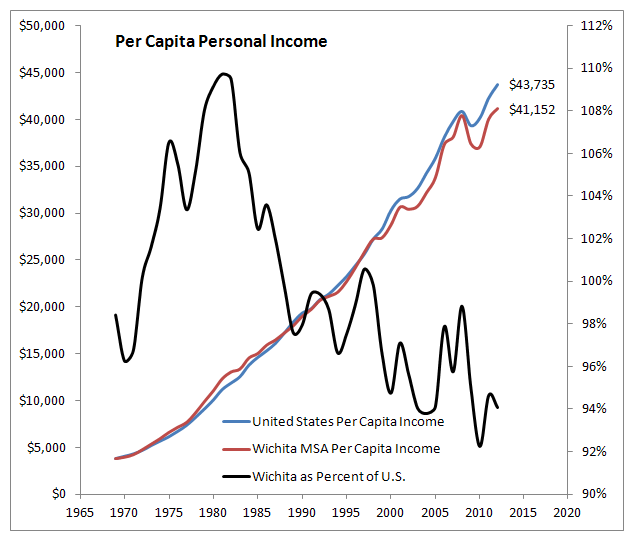 Since about 1980, the trend of Wichita as compared to the country is that Wichita is not keeping up, and is falling behind. 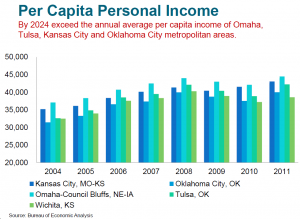 During the decade of the 1980s, per capita income in Wichita fell below that of the nation. 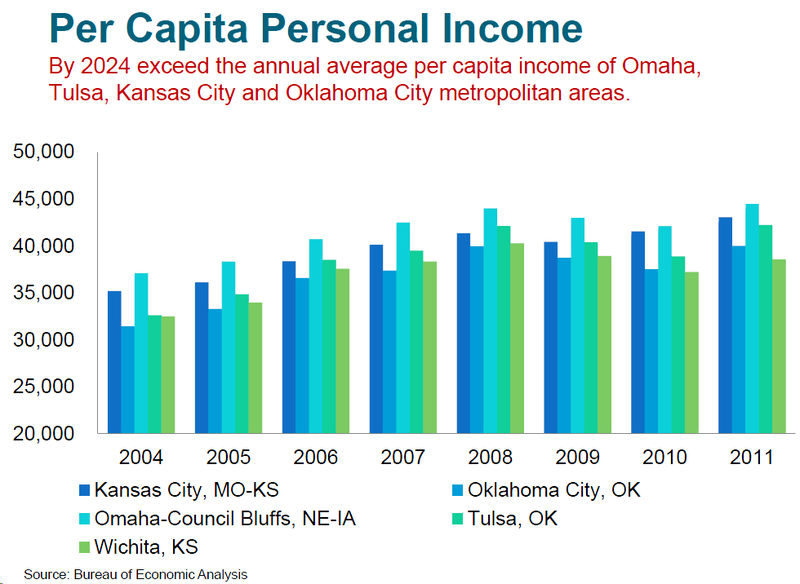 Wichita per capita income had been higher, but since then has mostly been falling farther behind. One of the Visioneering concepts is the idea of peers. 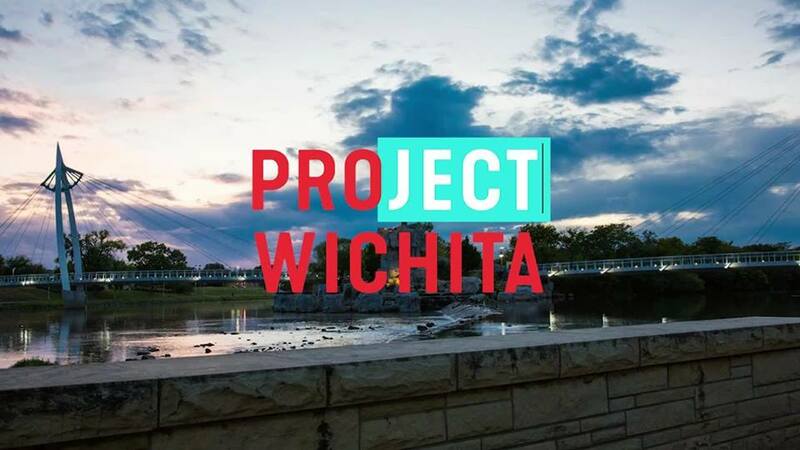 The cities Visioneering Wichita selected as Wichita peers are Omaha, Tulsa, Kansas City, and Oklahoma City. It’s useful to compare Wichita with these cities, and also with a few others that are comparable to Wichita and interesting for other reasons. 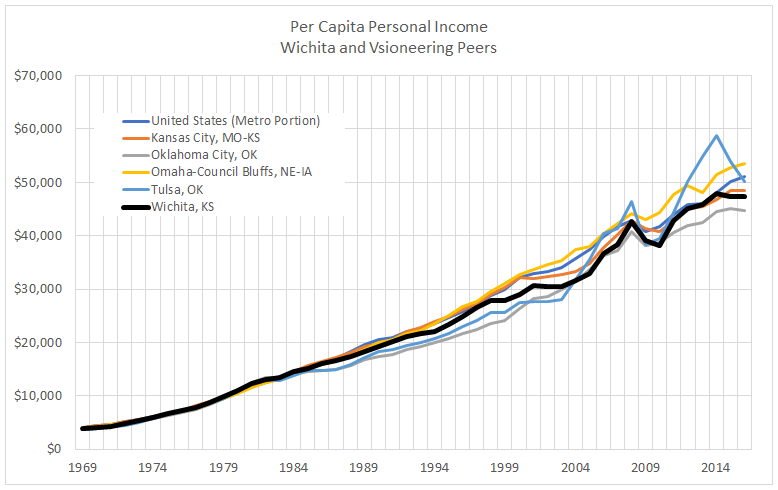 Wichita per capita income growth compared to peers. Click for larger version. 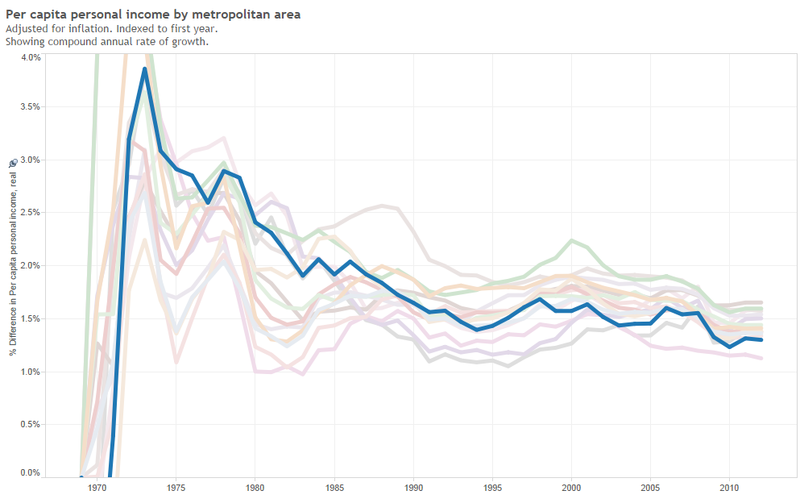 Nearby are two snapshots from an interactive visualization of per capita income growth. Wichita is the dark line in each of these charts. 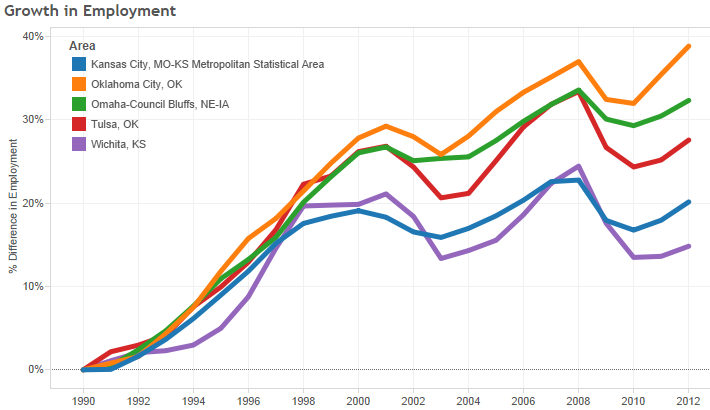 As you can see, by the last year of available data (2012), Wichita is near the bottom in performance. It wasn’t always that way. In early years, Wichita did well. 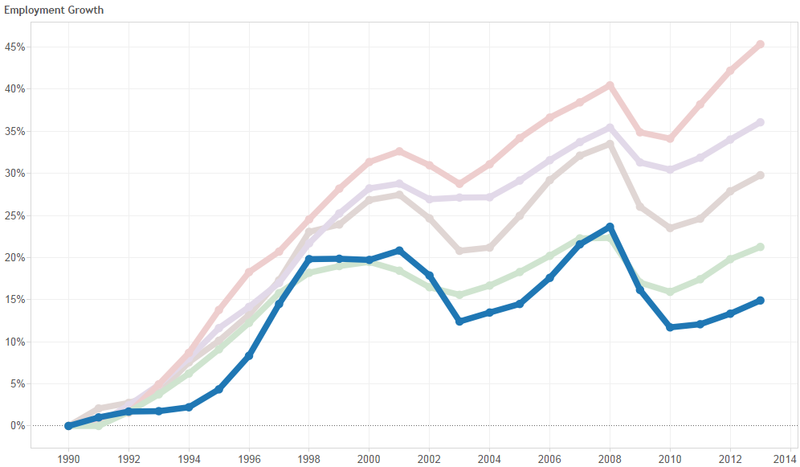 Per capita income growth in Wichita and peers, annual rate of growth. Click for larger version. 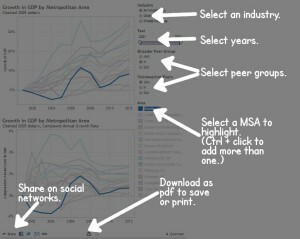 The interactive visualization holds data from the U.S. Bureau of Economic Analysis and was created using Tableau Public. Click here to open it in a new window so that you may form your own conclusions. The current stance of Wichita civic leaders is that we need a plan to create jobs. But we’ve had plans, with Visioneering being just one. These leaders also tell us that Wichita can’t compete with other cities in economic development because Wichita’s budget is too small. But as I show here, when Wichita leaders complain about a small budget for incentives, these officials don’t include all incentives that are available and regularly used. Not nearly all. Per-capita income is a bad measurement because it rewards cities that are losing people due to domestic migration and punishes those who are gaining. Even without the per-capita issue, personal income is not a clean measure. Personal income can increase because federal transfer payments grew, employers had to spend more to provide health care benefits, and other items that have nothing to do with measuring relative economic growth. Better measurements would be private sector jobs, private sector GDP and private sector wage and salary disbursements. Unless the point of Visioneering is to grow government, the measurements should only be of private sector elements. Further, the residents of a state can be better off even if that state’s per-capita or median income decreases. If, for example, 50,000 low income agriculture workers move into Texas, those workers’ incomes almost surely rise (or else they would not have moved there). The residents and business owners in Texas who benefit from their labor services are better off, and the final result is that no one is worse off. But the per-capita income in Texas may actually go down if the low income agricultural workers earn less than the state’s average wage. Compared to peer cities, Wichita performs well in growth of local government jobs, but poorly in creating private sector jobs. I’ve prepared statistics from the Bureau of Labor Statistics, U.S. Department of Labor for Wichita and two groups of peer cities. One group is our Visioneering peer cities. A second group includes those cities plus cities that Visioneers traveled to on official visits, plus a few others. The results are shown nearby. (Click on charts for larger versions, or click here to use the interactive visualization.) This data is annual data through the complete year 2013. The presentation of the data is indexed, so that each area starts at the same relative level and we can compare the relative growth over a period of years. 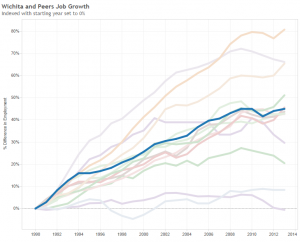 Local government job growth in Wichita compared to peer areas. When we look at the growth of local government jobs, we see that Wichita does relatively well, usually in the top half of job growth compared to these peer areas. 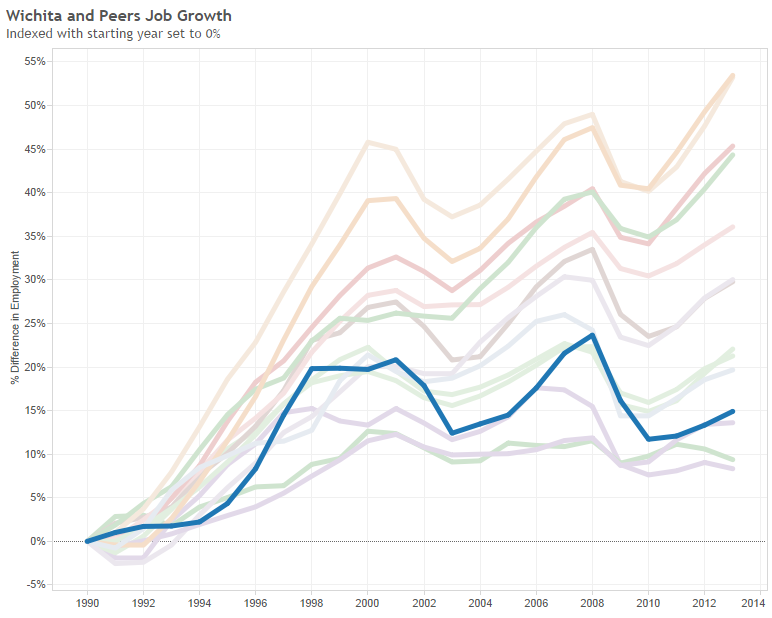 Private sector job growth in Wichita compared to peer areas. 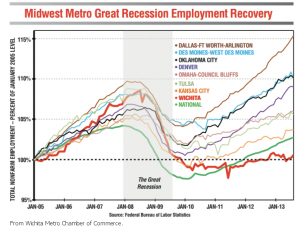 Looking at private sector job growth, Wichita appears near the bottom. The private sector is growing very slowly in Wichita, compared to our peers. We must remember that it is the private sector that pays for government jobs and the other costs of government. 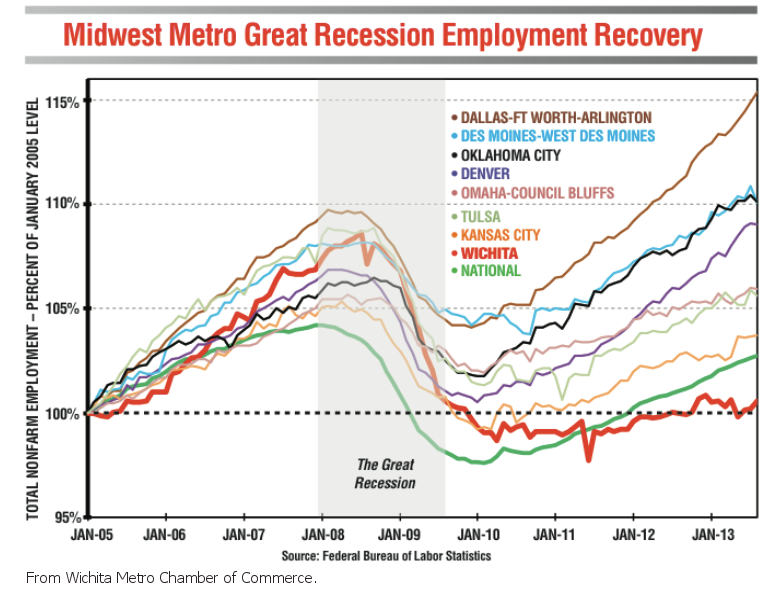 When we couple slow growth of the private sector in Wichita with faster growth of local government jobs, we’re setting the stage for even slower growth of the type of jobs that produce prosperity. 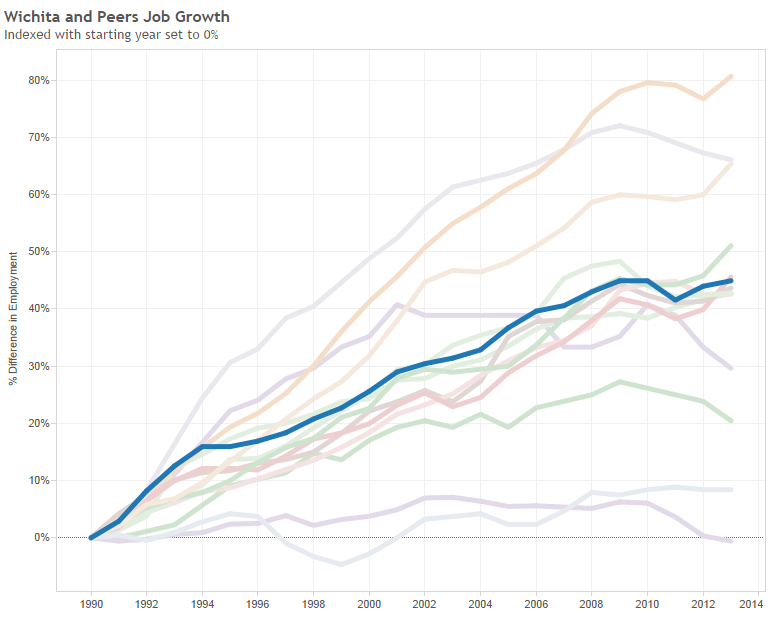 Interestingly, Wichita performs better in private sector job growth than Springfield, Illinois. I chose to include that as a peer metropolitan area because that’s the immediate past city in which Gary Plummer worked. He was president of that city’s Chamber of Commerce, and is now president of the Wichita Metro Chamber of Commerce. Wichita also does better than Wichita Falls, Texas. That city is the immediate past home of Tim Chase. He was the head of Wichita Falls Economic Development Corporation, and he’s now president of Greater Wichita Economic Development Coalition, a subsidiary of the Wichita Metro Chamber and the primary organization in charge of economic development for the Wichita area. As Wichita prepares to make decisions regarding economic development — including a possible sales tax to fund economic development — we need to be aware of our recent history. Wichita leaders contend that Wichita can’t compete in economic development with other cities because the budget for incentives is too small. But when making this argument, these leaders don’t include all incentives that are available and used. As shown in the analysis Contrary to officials, Wichita has many incentive programs, the excuse that Wichita does not have incentives is not valid. You may use the visualization yourself and draw your own conclusions. Click here to open it in a new window. 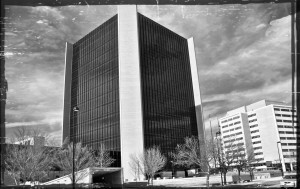 Wichita economic development incentives: Do they help? 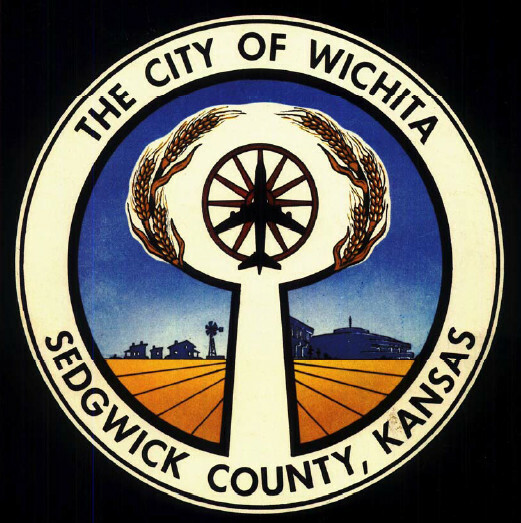 The Wichita City Council regularly awards economic development incentives. Are these incentives helpful, or not? In November the Wichita City Council granted Industrial Revenue Bonds to Spirit Aerosystems. The amount of the proposed bond issue was $49,000,000. The purpose of these IRBs is to allow the recipient to escape the payment of property taxes, and often sales taxes too. This action by the council may exempt up to $49,000,000 of property from taxation, both ad valorem (property) and sales. A 100 percent exemption is proposed for five years, plus a second five years if conditions are met. The city uses benefit-cost ratios to justify its expenditures on economic development incentives. The reasoning is that by spending cash (such as on a forgivable loan) or forgiving taxes (as in the current case), the city (and county, state, and school district) gain even more than they give up. 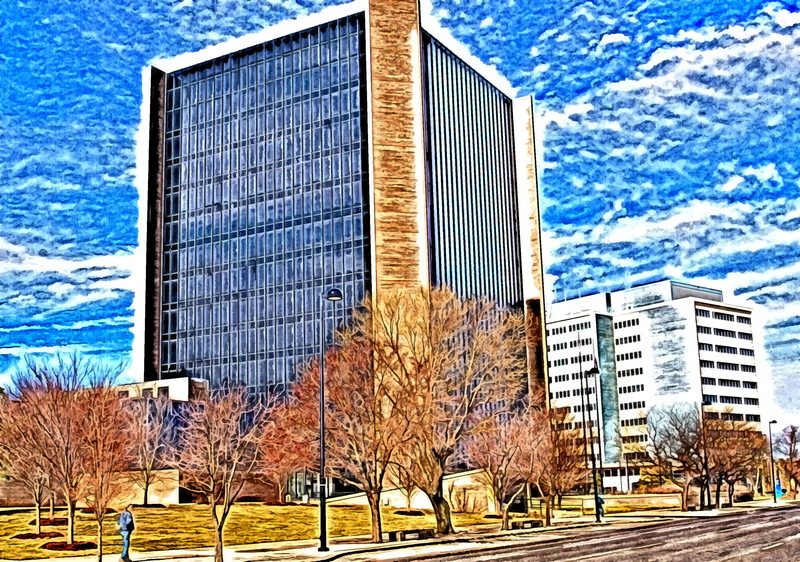 Generally, Wichita requires a benefit-cost ratio of 1.3 to 1 or better, although there are many exceptions and loopholes that are used if a potential deal doesn’t meet this criteria. The council’s agenda packet gives benefit-cost ratios for the various taxing authorities, but it doesn’t list the dollar amounts of the tax abatements. Usually these dollar amounts are supplied. It’s important to note that the benefits claimed from the IRBs are in the form of increased taxes paid. The harm of this incentive is that the taxes not paid by Spirit Aerosystems are shifted to other taxpayers. The money these taxpayers would have spent or invested is instead spent on taxes. 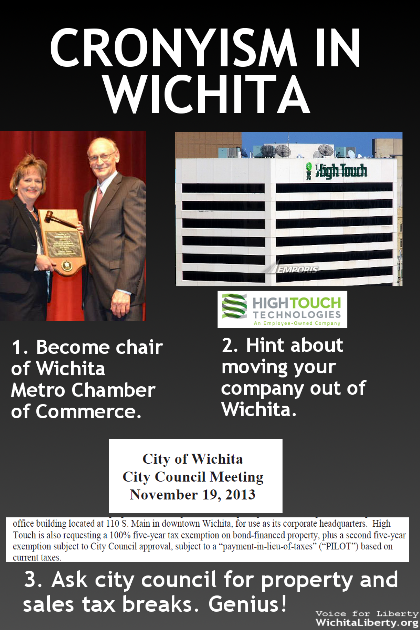 Instead of people and businesses firms deciding how to spend or invest, Wichita City Hall does this for them. This brings into play a whole host of problems. These include the deficit of knowledge needed to make good investment decisions, decisions being made for political rather than economic reasons, and the corrosive influence of cronyism. There is something the city could to do alleviate this problem. Would the city consider reducing its spending by the amount of tax being abated? In this case, the cost of these tax abatements will not be born by others. So far, the city has not considered this possibility. Recent reporting told us what some have suspected: The city doesn’t manage its economic development efforts. One might have thought that the city was keeping records on the number of jobs created on at least an annual basis for management purposes, and would have these figures ready for immediate review. But apparently that isn’t the case. We need to recognize that because the city does not have at its immediate disposal the statistics about job creation, it is evident that the city is not managing this effort. Or, maybe it just doesn’t care. This is a management problem at the highest level. Shouldn’t we develop our management skills of tax abatements and other economic development incentives before we grant new? 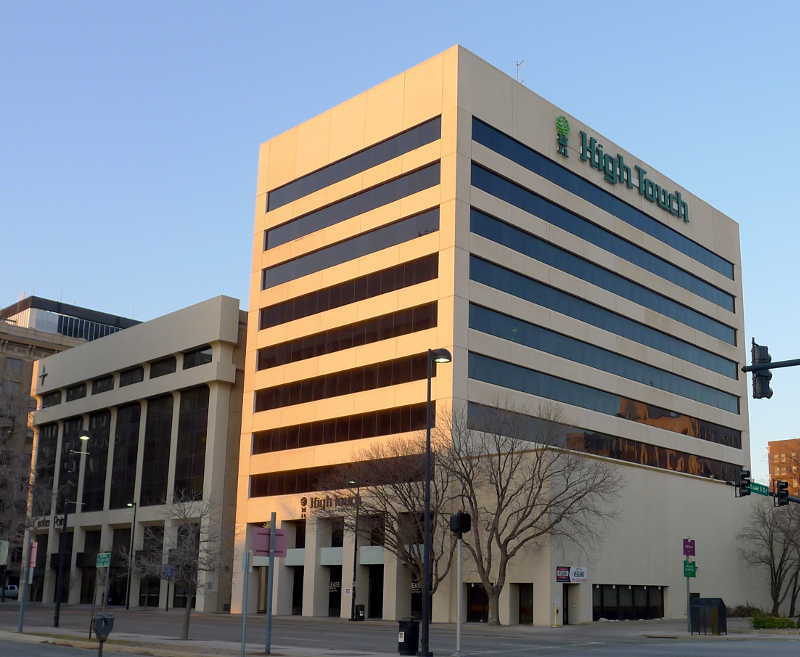 Despite the complaints of many that Wichita doesn’t have a rich treasure chest of incentives, the city has been granting tax abatements for years. What is the result? Not very good. 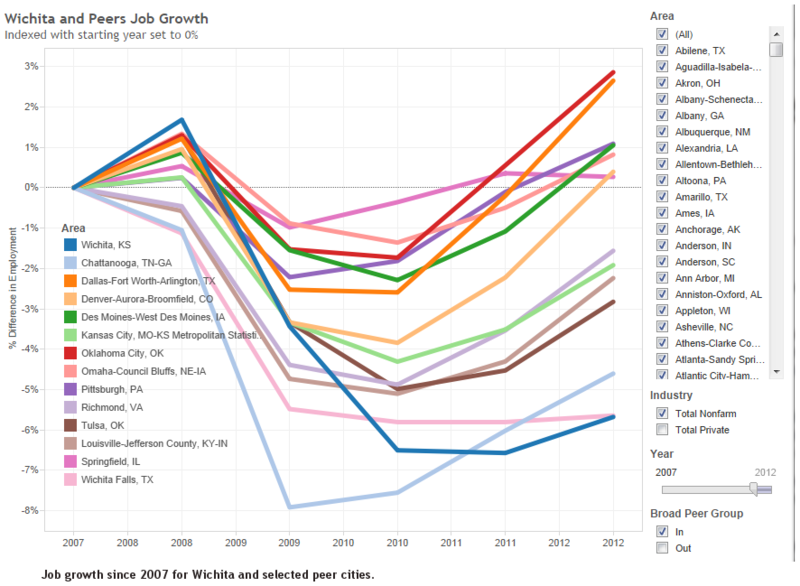 Wichita is in last place in job creation (and other measures of economic growth) among our Visioneering peer cities. 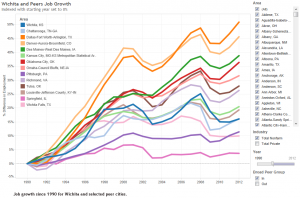 See here Wichita and Visioneering peers job growth. If we believe that incentives have a place, then we have to ask why Wichita has done so poorly. Particularly relevant to this applicant today: Boeing, its predecessor, received many millions in incentives. After the announcement of Boeing leaving in 2012, a new report contained this: “‘They weren’t totally honest with us,’ said [Wichita Mayor Carl] Brewer of Boeing, which has benefited from about $4 billion of municipal bonds and hundreds of millions of dollars in tax relief. ‘We thought the relationship was a lot stronger. '” Has anything changed? 1. The benefits that government claims are not really benefits. Instead, they’re in the form of higher tax revenue. This is very different from the profits companies earn in voluntary market transactions. 2. Government claims that in order to get these “benefits,” the incentives must be paid. But often the new economic activity (expansion, etc.) would have happened anyway without the incentives. 3. Why is it that most companies are able to grow without incentives, but only a few companies require incentives? What is special about these companies? 4. If the relatively small investment the city makes in incentives is solely responsible for such wonderful outcomes in terms of jobs, why doesn’t the city do this more often? If the city has such power to create economic growth, why is anyone unemployed? The mayor and council members have said that we need to diversify our economy. The award of incentives to Spirit Aerosystems reduces diversification. It gives special benefits worth millions to the largest company in our most concentrated industry. The costs of these incentives are born by other companies, especially entrepreneurs and start up companies. It’s these entrepreneurs and young companies that must be the source of diversity and dynamism in our economy. These research programs illustrate the fallacy of the seen and the unseen. It is easy to see the jobs being created by economic development incentives. It’s undeniable that jobs are created at firms that receive incentives, at least most of the time. But these jobs are easy to see. It’s easy for news reporters to find the newly-hired and grateful workers, or to show video footage of a new manufacturing plant. But it’s very difficult to find specific instances of the harm that government intervention produces. It is, generally, dispersed. People who lose their jobs usually don’t know the root cause of why they are now unemployed. Businesses whose sales decline often can’t figure out why. But evidence tells us this is true: These incentives, along with other forms of government interventionism, do more harm than good. Politicians and bureaucrats promote programs like this tax abatement as targeted investment in our economic future. They believe that they have the ability to select which companies are worthy of public investment, and which are not. 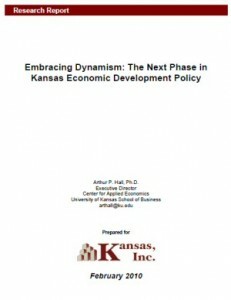 It’s a form of centralized planning by the state that shapes the future direction of the Wichita and Kansas economy. These targeted economic development efforts fail for several reasons. First is the knowledge problem, in that government simply does not know which companies are worthy of public investment. This lack of knowledge, however, does not stop governments from creating policies and awarding incentives. This “active investor” approach to economic development is what has led to companies receiving grants or escaping hundreds of millions in taxes — taxes that others have to pay. 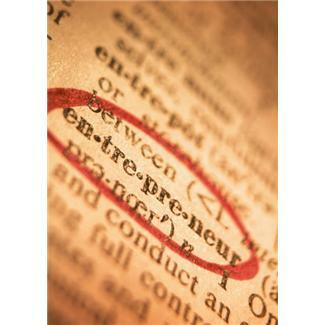 That has a harmful effect on other business, both existing and those that wish to form. 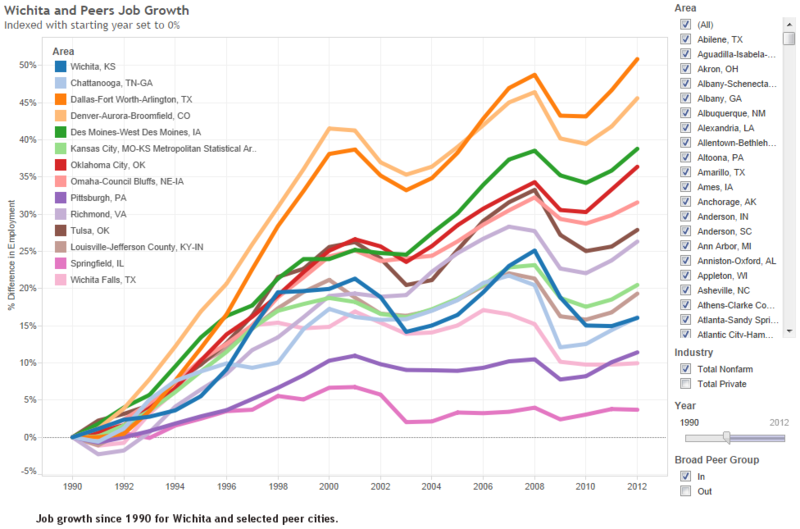 Looking at growth in GDP, Wichita lags behind the metropolitan statistical areas that we consider our peers (according to Visioneering Wichita), but not behind all the peer cities that I selected. Wichita does better than Springfield, Illinois, for example. 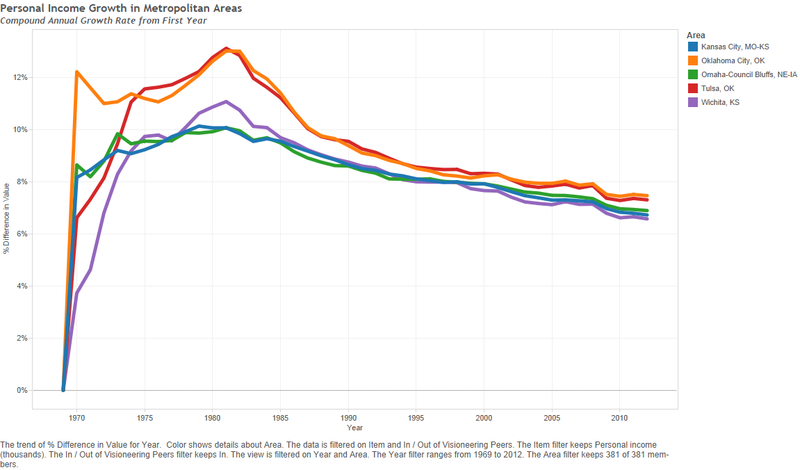 I chose to include that as a peer metropolitan area because that’s the immediate past city that Gary Plummer worked in. He was president of that city’s Chamber of Commerce, and is now president of the Wichita Metro Chamber of Commerce. Wichita also does better than Wichita Falls, Texas. That city is the immediate past home of Tim Chase. He was the head of Wichita Falls Economic Development Corporation. He’s now president of Greater Wichita Economic Development Coalition, the primary organization in charge of economic development for the Wichita area. If the Wichita-area GDP grew faster, Wichita could generate many more jobs. From 2001 to 2012, Wichita GDP grew at a rate of 0.734 percent per year, compounded annually. 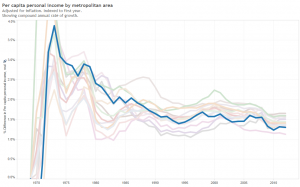 U.S. Metropolitan areas, as a whole, managed 1.571 percent growth over the same period. That seems like a small difference, just 0.837 percentage points. But over time, compounding adds up, so to speak. Here’s what it could amount to. 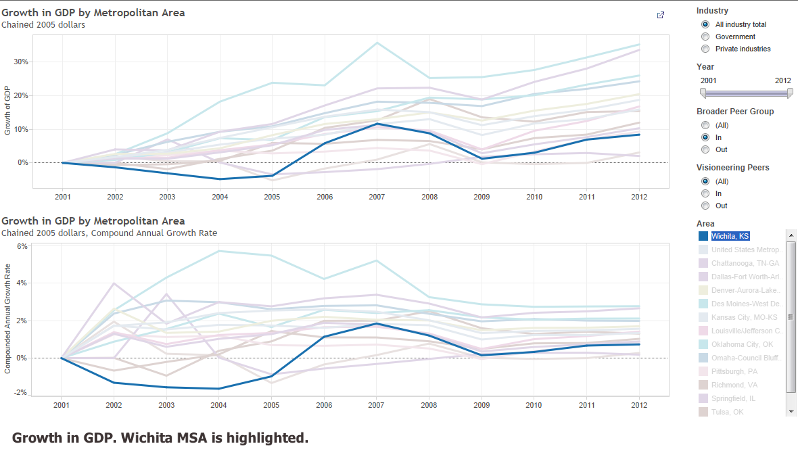 GDP in the Wichita MSA in 2012 was $29,644 million (current dollars). For that year the number of people working averaged 285,600, so each job contributed, on average, $103,796 to GDP. 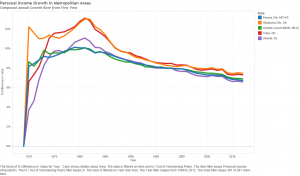 A metropolitan area the size of Wichita that grew at the historic growth rate of all U.S. Metropolitan areas would be producing an additional $2,751 million in GDP in ten years, compared to a metropolitan area growing at Wichita’s historical rate. That could mean an additional 26,000 jobs. 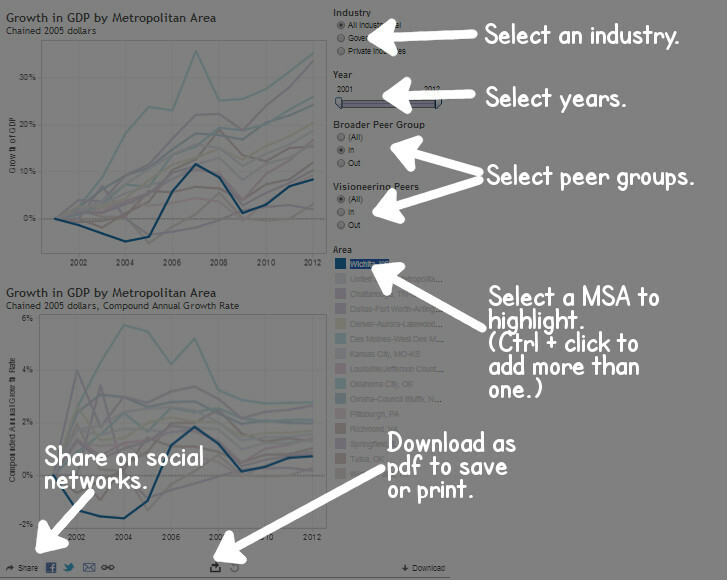 If you’d like to use the interactive visualization of metropolitan GDP data, you may click here to open it in a new window. Data is from U.S. Bureau of Economic Analysis along with author’s own calculations. Visualization created using Tableau Public. 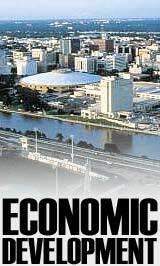 Wichita economic development: Worth higher taxes? In this excerpt from WichitaLiberty.TV: Wichita city and business leaders are likely to ask Wichitans to support a higher sales tax in order to support additional economic development efforts. Should Wichitans vote in favor of this? View below, or click here to view at YouTube. Another thing that a tax increase in Wichita might be used for is for economic development. That is, paying subsidies to companies so that they will provide jobs in Wichita. It’s felt that Wichita needs to step up its economic development efforts because things haven’t been going well lately. Not that everyone agrees. You’ve seen the charts I showed you, showing the growth of jobs in Wichita and also other economic indicators. When we compare Wichita with the nation as a whole and with our Visioneering peer cities, Wichita is almost always in last place. When I presented this data to the Wichita city Council, the Council members did not believe these numbers. So here’s a chart that was presented recently at a Wichita Metro Chamber of Commerce meeting. It uses the same data source that I use, the Bureau of Economic Analysis, and it shows the same data using the same methodology. It comes to the same conclusion: Wichita performs poorly. Our chamber of commerce and its leadership will use this poor performance to argue that Wichita needs to spend more money on economic development. And that’s a problem. Very often, local chambers of commerce support principles of crony capitalism instead of pro-growth policies that allow free enterprise and genuine capitalism to flourish. “The Chamber of Commerce, long a supporter of limited government and low taxes, was part of the coalition backing the Reagan revolution in the 1980s. On the national level, the organization still follows a pro-growth agenda — but thanks to an astonishing political transformation, many chambers of commerce on the state and local level have been abandoning these goals. They’re becoming, in effect, lobbyists for big government. You regular viewers know that we have a problem with cronyism in Wichita. This is exemplified by incidents like where a mayor votes to send millions of taxpayer dollars to a man who owns movie theaters, and then the mayor sells his barbeque sauce in those theaters. It’s when a real estate developer lists the mayor and city manager as business references when bidding for a city project and thinks that no one will care or notice. 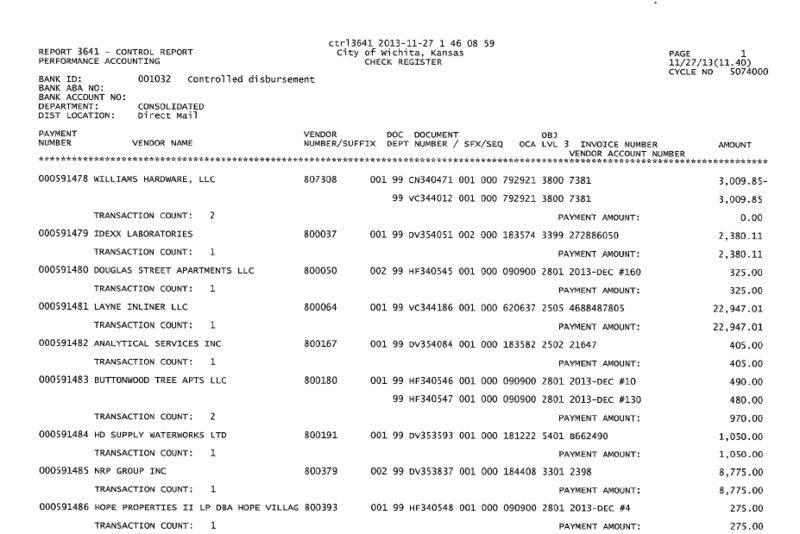 It’s when a city council member receives thousands in campaign contributions from an out-of-state construction company right at the time he votes to award a contract to that company. It’s when the city council votes to give over-priced no-bid construction contracts to their significant campaign contributors. In other words, instead of allowing people to direct resources to where they believe they will be most useful, our local government direct resources to their cronies. Where it’s useful for their political careers. 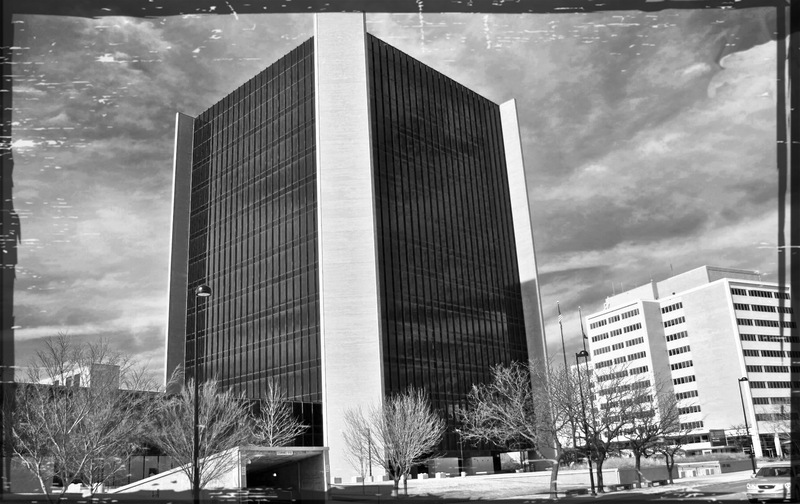 I’m of the opinion that it has harmed Wichita’s economic growth. It’s one of the reasons why Wichita is the bottom line in the charts we’ve seen. But many of our business leaders, and almost all of our political leaders, propose more of the same. That’s right. Instead of focusing on things like water and sewer pipes, government wants to raise taxes so that it can direct more of our economy. Having neglected our water and sewer infrastructure to the point where the mayor says we need to spend at the rate of $70 million dollars per year for the next 30 years, our city leaders are going to ask us for more tax money so that they can try to fix the Wichita economy. Let’s ask our business and political leaders some questions. 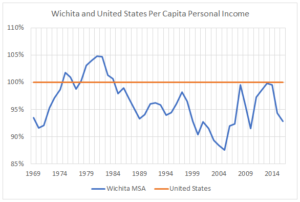 First, will we acknowledge Wichita’s poor economic performance, or will we continue to ignore the facts and statistics? 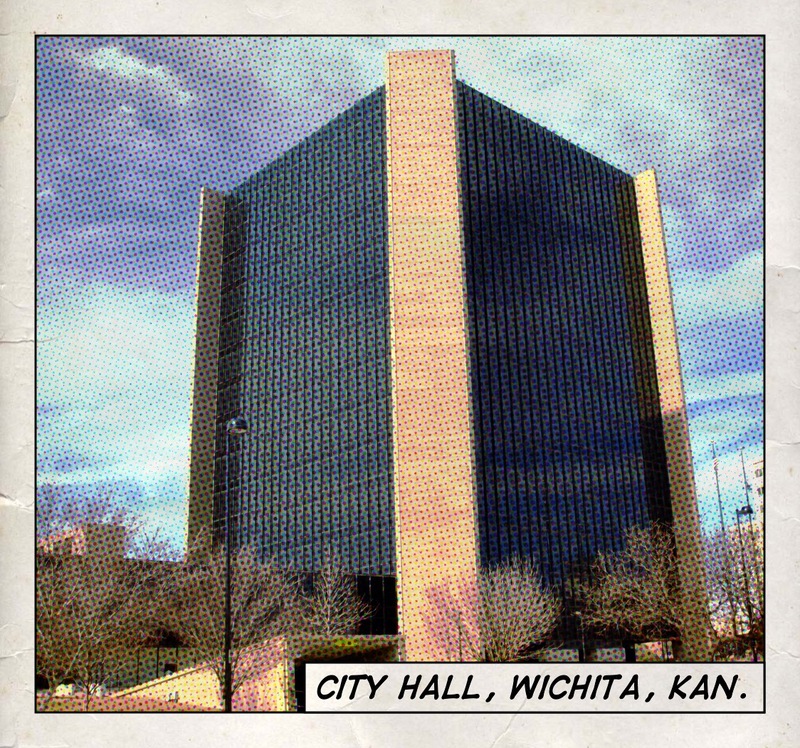 Second: Will we realize that the cozy relationship between city hall and a small group of insiders — Wichita’s cronies, if you will — is harmful and corrosive? Third: Will we realize that free enterprise and capitalism work better than cronyism? Incredibly, a prominent Wichita business uses the free market to justify its request for economic development incentives. A gullible city council buys the argument. While the amount of the incentive granted in the December 10 action is small, the meeting was useful in letting us understand how some prominent members of Wichita’s business community have distorted the principles of free markets and capitalism. As illustrated by the fawning of Wichita City Council Member and Vice Mayor Pete Meitzner (district 2, east Wichita) and others, elected officials have long forsaken these ideas. We must be careful when using the term incentive. In a free-market economy or capitalism, incentive refers to the motivation of the possibility of earning profits. Another incentive — the flip side of the same coin — is avoiding losses. That’s why capitalism is called a profit-and-loss system. The losses are just as important as profits, as losses are a signal that the economic activity is not valued, and the resources should be shifted to somewhere else where they are valued more highly. A few thoughts: First, Bombardier is not investing in the community. The company is investing in itself. Second, the free market system that the speaker seemed to praise is a system based on voluntary exchange. That flows from property rights, which is the fundamental idea that people own themselves and the product of their labor, and are free to exchange with others, or to not exchange. But when government uses incentives, many people do not consent to the exchange. That’s not a free market system. The representative from Bombardier also said that the city’s incentives would reduce Bombardier’s investment risk. There is little doubt this is true. What has happened, however, is that the risk has not been eliminated or reduced. It has merely been shifted to the people of Wichita, Sedgwick County, the Wichita public school district, and the State of Kansas. When government does this on a piecemeal basis, this is called cronyism. When done universally, we call this socialism. We can easily argue that actions like this — and especially the large subsidies granted to Bombardier the by state — increase the risk of these investments. Since the subsidies reduce the cost of its investment, Bombardier may be motivated to make risky investments that it might otherwise not make, were it investing its own funds (and that of its shareholders). 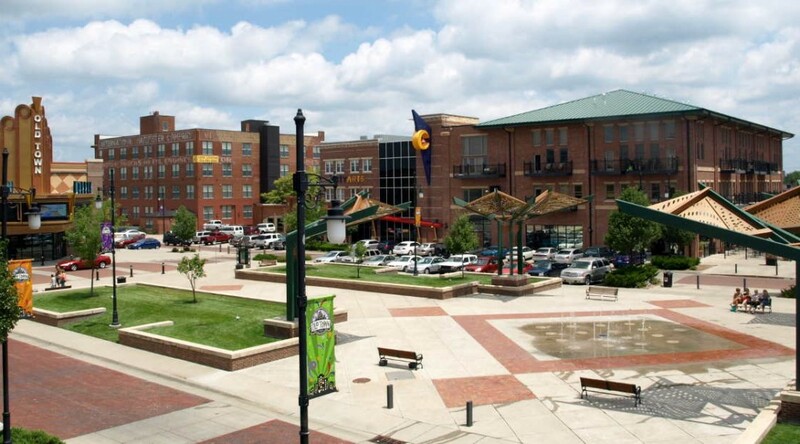 Wichita continues to lag behind its peer cities in job growth, according to data from the Bureau of Labor Statistics. The interactive visualization referenced below lets you select any number of metropolitan areas (or states) and track progress in job growth. The nearby chart shows Wichita and its Visioneering peer cities (click on charts for larger versions). 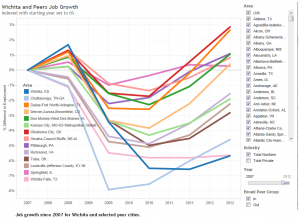 For about the last ten years Wichita has been in last place in job growth, and by no small margin. It wasn’t always that way. Results like this should cause us to question our economic development strategies and the people and organizations we have charged with managing this effort. Data for income in the nation’s metropolitan statistical areas is now available for 2012, so I’ve updated some visualizations with the recent data. This visualization presents three statistics: Population, personal income, and per capita personal income. For each measurement, I present the relative change from the previous year, but also the compound rate of growth. The latter lets us see the effect of long term trends compounded over time, rather than what may have happened in any single year. The charts, in their initial presentation, show the Wichita metropolitan area and our Visioneering peer areas. (You may add or remove other areas as you wish.) The unfortunate conclusion that we must draw from this data is that Wichita has not done well. In fact, Wichita is in last place among our Visioneering-identified peer areas. Others have noticed this poor performance; see Wichita in the bottom quintile in national economic index from the Wichita Business Journal for a recent example. Since 1991, the City Council has approved issuance of Industrial Revenue Bonds (“IRBs”) totaling $1.2 billion to finance expansion and modernization of Cessna Aircraft Company (“Cessna”) facilities in Wichita. The City Council also authorized 100% ad valorem tax exemptions for all bond-financed property for periods of up to ten years. 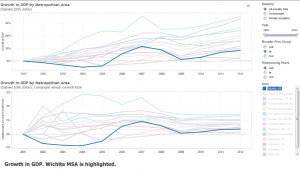 The Bureau of Economic Analysis, which is part of the U.S. Chamber of Commerce, provides economic data for metropolitan areas. 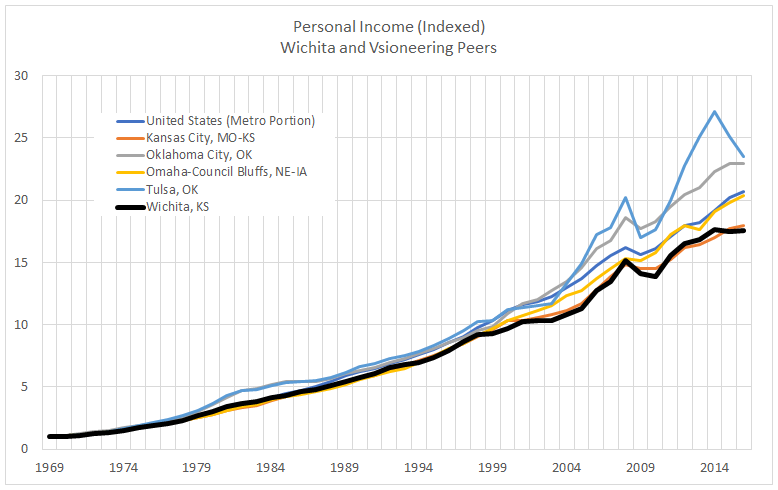 One of the measures that Visioneering Wichita uses as a benchmark of performance is personal income growth. Specifically, per capita personal income growth. 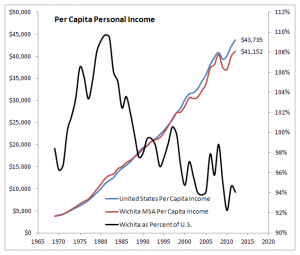 There are some issues related to per capita measures that require caution; see Wichita and peer GDP growth for an explanation. 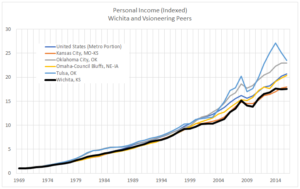 Considering personal income growth, here is what Wichita looks like compared to our Visioneering peer cities, based on data from BEA (click on charts for larger versions). This chart shows the compound annual growth rate in job creation. 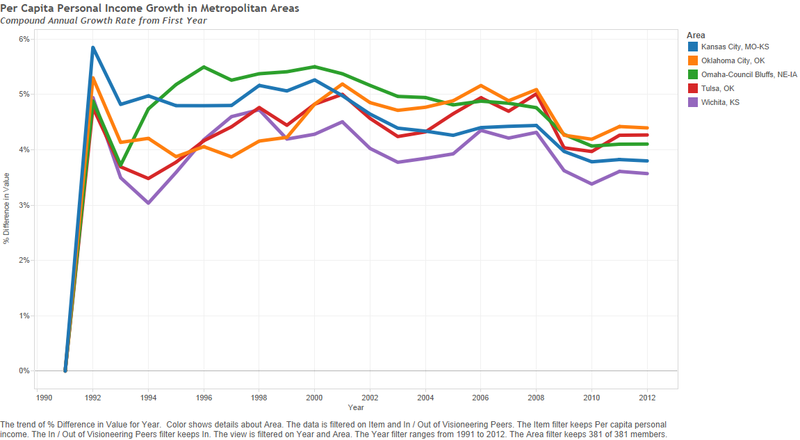 Note that Wichita, the violet line, is in last place. But it wasn’t always that way. 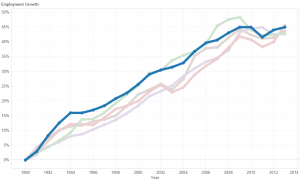 It was during the decade of the 1990s that Wichita started to slip to last place. Coincidentally, that is the decade in which Wichita started offering economic development incentives to Cessna. Since Visioneering uses per capita personal income, I also present it. This time, I start the chart with 1990 data. 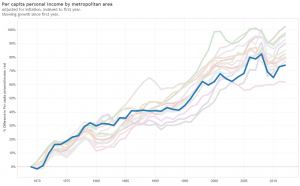 It’s much the same story as the previous chart: Wichita is in last place. Another benchmark Visioneering uses (but won’t present to the council) is job growth. Wichita does poorly here too, ranking in last place among our Visioneering peer cities except in one area: Government jobs. See Wichita job growth and Visioneering peers for details and a video. We should note that to the extent the government sector grows faster than the private sector, we become poorer. We might ask the mayor and council members how this proposed action will help Wichita catch up to its self-identified peers. After all, city documents state that we’ve granted IRBs to Cessna in the past: $1,200,000,000 worth, according to city documents. The action contemplated this week is for up to $40,200,000 in bonds, or about three percent of the total granted to Cessna. These amounts are not loans to Cessna from the city, but instead represent the value of property that Cessna may have exempted from taxation: property and possibly sales taxes both. A major reason why this action is harmful to the Wichita economy is its strangling effect on entrepreneurship and young companies. As Cessna and other similarly-situated companies escape paying taxes, others have to pay. This increases the burden of the cost of government on everyone else — in particular on the companies we need to nurture. This is being brought into sharp relief as the council considers asking Wichita voters to approve a sales tax increase. Last month the Wichita Metro Chamber of Commerce featured a speaker who stressed the importance of entrepreneurship, as evidenced by the headline in the Wichita Eagle: Gallup CEO tells Wichita Chamber: Treat entrepreneurs like star athletes. There’s plenty of other evidence that entrepreneurship, in particular young business firms, are the key to economic growth. But Wichita’s economic development policies, as evidenced by this action the council is considering, are definitely stacked against the entrepreneur. As Wichita props up its established industries, it makes it more difficult for young firms to thrive. Wichita relies on targeted investment in our future. Our elected officials and bureaucrats believe they have the ability to select which companies are worthy of public investment, and which are not. It’s a form of centralized planning by the state that shapes the future direction of the Wichita economy. There is also substantial research that is it young firms — distinguished from small business in general — that are the engine of economic growth for the future. We can’t detect which of the young firms will blossom into major success — or even small-scale successes. The only way to nurture them is through economic policies that all companies can benefit from. Reducing tax rates for everyone is an example of such a policy. Abating taxes for specific companies through programs like the Wichita city council is considering for Cessna is an example of precisely the wrong policy.